Full disclosure: the game authors, Senores Onça, Gibrin and Miyaji used to play in gaming events with the one and only Sizinha. Of course we’ll still give it a fair review, but don’t say later we didn’t tell. Imagine, for a second, that you are on a board game themed quiz show. The one million Monopoly Dollar question is for a game by a Brazilian team of authors about a sunken city. You let out a sigh of relief. This is easy, you know the answer. “Atlantis!” you blurt out. The room suddenly goes dark and your hear the tell-tale Bebooooooooooooooooop of a wrong answer. How? How could your answer possibly be wrong? To be fair, the odds were in your favour. There is at least ten games with Atlantis in their title, plus a whole lot more with Atlantis as a theme. But while Atlantis may be the most famous municipality that went under the waves, it’s not the only one. Vineta – sometimes even called the Atlantis of the North – was a city on the coast of the Baltic Sea, if legend is to be believed. Just like Atlantis, Vineta was sunk by a horrible disaster, and some variants of the legend have it that the city was destroyed by the gods in punishment. Lets have a look at the city first. With a little bit of artistic license, the city of Vineta is not on the coast of any sea but is, instead, an island. The island of Vineta consists of three concentric rings,each with three districts, so only the outer ring is bordering the water at the start. 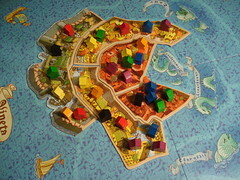 The inhabitants of Vineta are represented by little wooden houses in different colours, one more colour than there is players. Every player has their own identical set of cards with the symbol of their deity on the back. Every player also gets two paper markers in the beginning, one showing a district and one showing a colour. It’s his declared goal and victory condition to protect these people and the neighbourhood from the wrath of the other gods. The district chips take a bit of turning sometimes to figure out which is yours, but with all districts having a different shape it’s not a problem. The colour chips mostly work as well, but the orange and red tones used are horribly close. If you don’t have perfect lighting condition, you will confuse these two and experience an awfully embarrassing defeat for defending the wrong colour, so do yourself a favour and mark one of them. 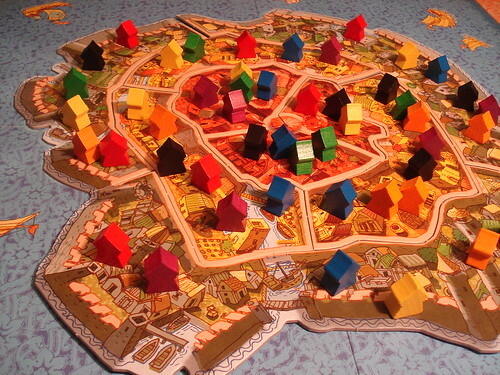 In the last step of the preparations, players take turns putting houses of any colour into the city. It’s best not to put too many houses of your own colour here, giving away which colour you want to safe this early in the game is not a winning strategy. Vineta plays in 8 rounds, each round has (usually) 3 turns, and each round ends with the loss of one district of the city, leaving exactly one that survives the catastrophe. So how do we get rid of the city already? Every turn, each player chooses a card from his hand of seven and places it on the table face down. Starting with the current start player, every player turns their card face up and uses it. Most cards are flood cards with values from one to four, used to attack a district of the city. With one of those, you either chose to participate in sinking a district already under attack, or you open a new battlefield. To participate, you simply place your card with the row of cards already played against that district. To attack a new district, you place your god marker on it and start a new row of cards next to that district. The god marker does not have any significance besides the fact that you only have one of them, so you can only initiate an attack against one district per round, but you can participate in as many attacks as you want. Of course, you can only attack districts that are actually bordering the sea – sinking districts from the inner rings is not possible until they are exposed by removing at least one outer district. The other kind of card you may have played is an action card. Action cards come in different flavours, but they are all fun for you and not so much fun for the people affected by them. The most straightforward is the Decree. Decree increases or decreases the attack value against a district by seven, but does not count as a flood card. Other cards can remove a flood card from an attack or move it to another attack, can move houses into districts under attack, out of districts under attack or just wildly around the city, can quarantine the district so no one can move out or even make the current round one turn shorter or longer. Action cards are very powerful and change the outcome of a round significantly, but on the other hand, they don’t give you any points by themselves and each card occurs in your stack either three times or once only, so they are by no means unbalanced. When all players used their chosen card, the next turn starts with the player following the start player. Player order is a wee bit confusing in Vineta because there is not one but two player markers. The first one, shaped like a lighthouse, is the round marker. This marks the player that started the current round. The other one is the turn marker, just a little disk. This one marks the player that starts the current turn. It works like this: after every turn, the turn marker advances to the next player. But when the round is over, the round marker advances to the next player and the turn marker returns to that player as well and he starts the first turn of the new round. It becomes second nature after the first game, but in the beginning it seems needlessly complicated. The reasoning behind that rule, as far as I can tell, is that it makes sure every player gets to start a round at least once. If you just keep advancing the turn marker, a game with three players would have the same player order every round, and that would hardly be fair. After three turns – barring action cards – the round is over. The district that has the highest sum of attack cards played against it will sunk to the bottom of the ocean now, drowning thousands of innocents and – more importantly – award points to the gods that sank it. 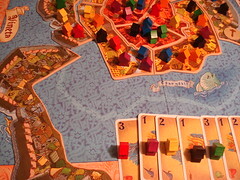 All houses that were on the sinking district are distributed between the players in order of their flood cards. The player that started the attack takes the first house, the player with the second card the next and so on. If there is more houses than cards, repeat until the houses are gone. If there is more cards than houses … well, someone should have counted before they sunk the island. The colour of these houses is irrelevant. saving your district of the city is worth two points if it was from the city centre, four if it was from the inner ring and seven from the outer ring. The unequal distribution of point is intended to make up for the fact that defending an outer district is close to impossible because it can be attacked from the first round – and, ironically, because it’s worth a lot of points. The city of Vineta sinks in about 45 minutes – not enough time to save the furniture – and the amount of fun you had to get there depends strongly on the number of people (as well as the people themselves, of course, but that is true for every game). With two people, Vineta is pointless: you either agree which district to sink, or you don’t, and when you don’t everything depends on your cards. With three or four people, it’s fun, but it only really shines with five or six players. Having more players opens more battlefields to decide between, more options to temporarily ally against one player “because I’m sure he’s blue” and then backstabbing your allies with an action card on the last turn. With more people, the game does demonstrate a high amount of chaos. There is no way to foresee what everyone will do on their turn, except in a very limited sense if you’re a really good card counter. But being chaotic should not be confused with being random here. You are still firmly in control of your victory by hiding your true objective, figuring out the other player’s goals and subtly trying to influence them in your favour. Some luck is involved in having the right cards at the right time, of course, but since everyone has the same cards in their stack, this mostly evens out over the course of a game. You rarely end up without any choice what to do, and a lot of your actions will make your opponents satisfyingly unhappy – try removing their cards from the sinking district or moving the houses you believe to be theirs into the sinking district to see what I mean. Having a good poker face is recommended when you’re the victim of these things. Now, if you think back to the first paragraph you will remember that the quiz question specifically asked about a game by a Brazilian team of authors. Why did I consider this worth mentioning? Well, how much did you hear about board games in Brazil so far? Exactly, not a lot. But there is a very active and growing gaming community there, and after I discovered Vineta, I read and heard about more game projects from there that give a very good impression. If Vineta is a typical example of Brazilian game design, I’m looking forward to more games seeing international distribution. Next Post:Meople News: Does crushing fingers make me a Cylon?